My latest faux fur crush is this drop dead gorgeous two-tone coat by Bandits, my first purchase from the brand - though unlikely to be the last! Never thought I'd say this, but I now love colourful faux fur. 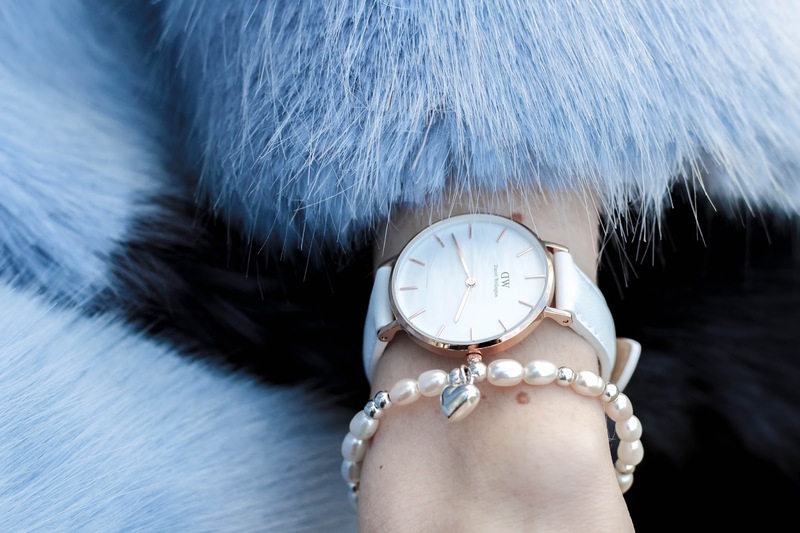 The icy blue shade is perfect for winter, while still keeping the heat in thanks to the longer length. I've got to admit, I've always had a bit of a 'thing' for the glamorous combo of faux fur and sunglasses - so, bring on the winter sun! 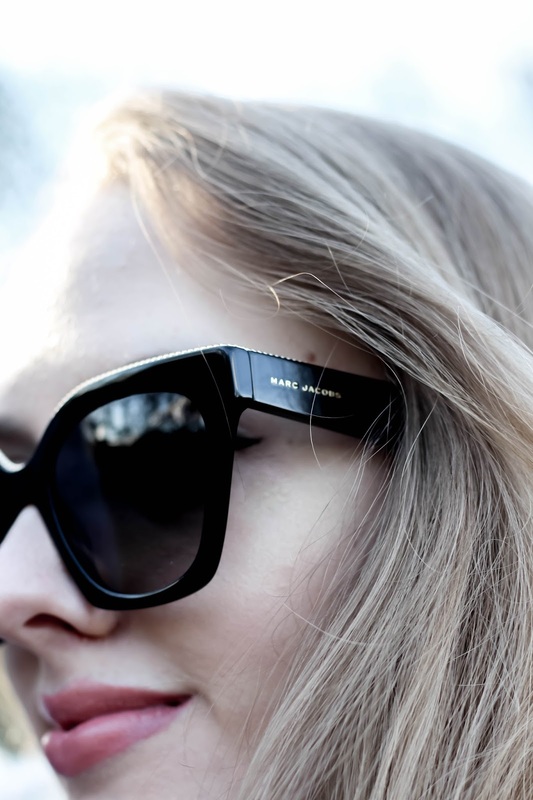 Speaking of which, these Marc Jacobs beauties from Sunglasses Shop have been my go-tos for the past month. 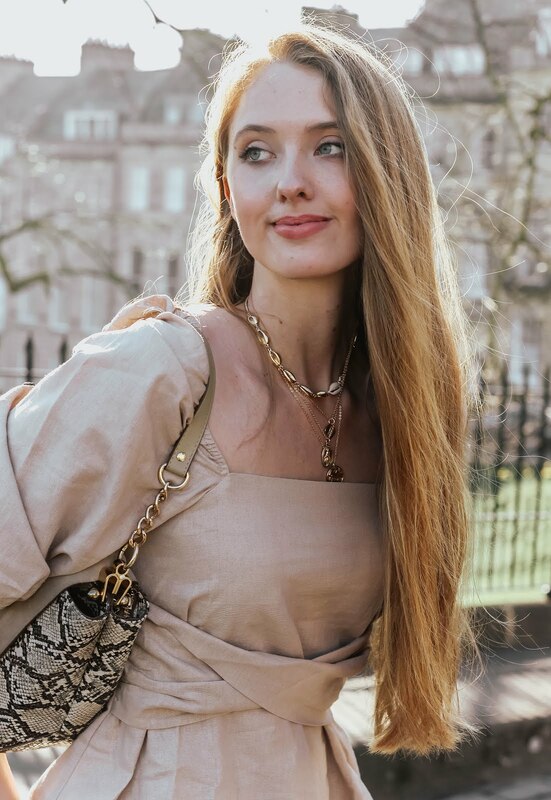 I absolutely adore the gold metal running over the top of the frame, as well as the luxe oversized square design - expect to see me wearing these again (and again, and again...). Opt for this chic classic black pair, or stand out with the patterned version. There are some seriously dreamy, colourful options around right now. Besides this new addition to my wardrobe, I'm also tempted by striking pink faux fur coats such as Jakke's animal stripe or hot pink versions at ASOS (so stylish!). Anyway, I've linked some other fabulously colourful options below. Enjoy! I'm really looking forward to hearing your thoughts on this winter look! Also, even more interested for you to share your thoughts on the great fur debate. Do you opt for faux fur? Let me know in the comments below! You look amazing, love the winter look. Love the colors of the faux fur, gorgeous! Love the blue, such a nice change from regular fur colours & so important that it's faux! Can't wait to see more on the modelling! So excited for you! Lov the blue color against the black, it really pops! Love the coat!!! It's so pretty!!! That's been an ongoing topic of discussion. I'm all for faux fur. Any kind of cruelty to animals doesn't work in my book. I need to make so me changes with my cosmetics. Love your new coat Gabrielle. It's a beauty. Also adore your bag. You look beautiful. That is such a fun coat! It looks so soft too. I don't know anyone who wears fur or even faux fur but that's because it doesn't really get that cold here. I'm sure I'd be layerign up all the faux fur I could if I was facing snow in winter, haha! I really don´t get why people wear real fur anymore either. I mean, vintage pieces, okay, but newly bought stuff? I´ll stick to fake fur too. That powder blue looks amazing on you! Also props for faux fur! Hi Gabby! Congrats on all of your recent activities. It seems you have been having a lot of fun lately! I love the coat, but I especially love the idea of winter sunglasses. Now on the faux fur debate...whilst I totally detest the unnecessary and wasteful cruelty to animals, shouldn't we by the same merit banish the purchase of genuine leather items and the consumption of meat? Beautiful and very elegant outfit ... the color of the faux fur is splendid! What a beautiful outfit, the blue on the coat suits you so much!! Gorgeous pictures too! Love this outfit Gabrielle!! I'm 100% on faux fur, I think it looks great and there is really no need to wear real fur. Ooooh, you've been getting into all kinds of fun! I'm with you completely. Faux fur is a wonderful alternative, and you don't have to kill innocent animals to achieve it. Plus, it just looks so cozy and chic! You look absolutely gorgeous in this coat, girlie! I love the two toned pattern and color combo, so chic. Blue looks gorgeous on you. I agree, these days, there are so many great faux fur alternatives to choose from, which is my personal preference, too. Thanks for sharing, beauty, and I hope you have a great week ahead! Love the two color.. gorgeous. I love so much this look with this beautiful faux fur jacket. I love this blue pastel color so much. I love your faux fur outfit! How fabulous! I am in love with your whole wardrobe! That shade of blue is seriously my favorite! You look gorgeous !!! I love your fur coat and everything. that colored fur is absolutely gorgeous! I love this so much, glad you're spreading a message on faux fur. It's a must! You do look beautiful my dear. This coat is adorable and you have styled it so well. I opt for faux fur myself, but I'm strongly against judging people who wear real fur because there are many things to consider. As you said, it's cool to be kind. I like this kind of positive message you're presenting as opposed to sometimes radical messages by animal activists. I think these kind of positive messages and gentle encouragements do a lot more good than negative messages. I was sad to discover that many animal activist are extremely aggressive in their campaigns, sometimes they even physically and verbally assault people wearing fur, and they often twist the truth about fur production. I heard of cases where animal activist have actually killed and tortured animals themselves then filmed it as a proof of cruelty against the animals. Skinning animals alive would actually damage the fur, so it is not something that anyone who knows anything about fur production would do. Western countries typically have strict laws to ensure animals are killed as humanely as possible. I'm aware this may not apply to all countries, I'm not against activism but I was shocked to see what lengths these animal activist go to prove their point and I think it is something we need to have in mind as well. Encouraging people not to wear fur is fine as long as have our facts straight because lying about something can only hurt the goal in the future. I do agree that faux fur is just as warm as real fur. The advancement of technology has allowed us to use synthetic materials, making fur unnecessary. Still, faux fur is not available to everyone, some people might not afford to buy anything at the moment, and if someone has a fur coat from their grandmother, surely it is better to wear that coat then toss it in the garbage? Vintage fur has environmental and ethical benefits. That's another thing to consider in this debate. Probably the best thing we can do to contribute to the end of fur production is to stop buying fur. Vintage/recycled fur might be an exception to that rule as it doesn't directly encourage fur production. I heard of people who specialize in rescuing old fur coats, redoing and selling them, and that sounds pretty eco-friendly to me. I'm pretty confident that fur production will become obsolete because of the economical factors. The production of synthetic materials is becoming more and more advanced and affordable every day. Fur production, in contrast, remains an expensive process. This is a very important message, and well done for speaking up about it Gabrielle! Why wearing real fur when we know all the horrible things that happen to these animals. Your coat looks amazing and is even better for being cruelty-free! And, of course, I'm against real furs as well, but I think that in many cases a too violent and aggressive campaign risks to put animalists in a very bad light. Anyway, I loooove your fur: that color is really chic and cool, and looks amazing on you! Grear combo, Gabrielle, as usual! Oh this coat is gorgeous! I love it and saw a similar one in Ted Baker. I love faux fir. I have a friend who thinks it encourages the wearing of real fur, but I don't think so, I think this is carrying it a bit far. I'm just so so glad you're doing great Gabrielle! Because you deserve all the best collabs! Looking absolutely beautiful as always! Oh my, that coat is absolutely gorgeous! I adore the colour and the two tone effect too. Looking lovely as always girl. WOW, that coat is something, I love it on you! I tried one on and ended up looking like a major fluff being, it doesn't help being under 5' haha!! What a lovely post Gabrielle and I agree with you, faux fur really is the way forward, not only is it stylish but it's cruelty free which is a wonderful thing indeed. Your blue faux fur coat is gorgeous and it teams so nicely with your luxurious sunglasses, they look very chic on you indeed! Marc Jacobs is a great brand. I saw your GORGEOUS bridal-wear shoot by the way and I must say you really do make quite the spectacular model, stunning images. Sending love to you Gabrielle! SO much love for this post! Honestly, I don't see any reason to wear real fur these days. The faux fur they make is SO amazing and soft and gorgeous. You look amazing. And I'm so excited to see the bridal pics! Low key obsessed with bridal wear these days! I'm a huge fan of faux fur coats, and I have been for years as it suits my personal style really well and they're also super warm! I couldn't agree more that in this day and age wearing real fur is so unnecessary. Not only can you find really soft faux fur coats that don't look or feel cheap, but we also don't hunt animals and have to use their fur to keep warm anymore because we live in a modern society and our clothing should reflect that! Such a fab combination of furs dear! The soft blue color really pops out from the black. Really cool and cozy look. Love the glasses too! Faux Fur is the only fur possible to me. I love the way funny colored ones look! Sadly faux fur sold by major retailers has recently been exposed to contain real fur. Link to one of may articles available online below. If you want to be kind, please consider ditching faux fur too. Love the color, would love to have it myself. Ohhhh that blue is gorgeous!!!!! Love faux fur (as long as it actually IS faux what with the recent posts about some having real fur grrrrrrr)!!!! That blue though is gorgeous! !